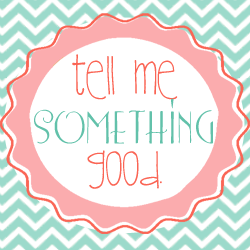 The Open Door Classroom: Tell Me Something Good! What a crazy, busy, and exhausting week this has been! I am trying really hard this year to focus on the positives, both personally and professionally because it's easy to get completely stressed out. When I saw this "Tell Me Something Good" linky, I knew I had to join in! Be sure to check out Rowdy in First Grade's blog and linky. All you have to do is share one positive from home and one positive from school. I don't have anything too specific because I am so truly blessed in all areas when it comes to my family. My husband is pretty close to perfect and I am so in love with my little boy. He is starting to talk more and I just can't get enough of all his hugs and kisses. I never knew that being a mommy would be this wonderful! So what are your "Something Goods?" Be sure to link up and share! Just linked up as well..I love reading and focusing on all the positives from school and home. I am a 2nd grade teacher as well and my babies are just so sweet. I know what you mean! It really makes the difference. Last year I taught 3rd so I definitely wasn't really prepared for how little they are at the beginning of 2nd, but I just love them. It's so sweet that the little boy things your classroom is magical. Awwww... Hope you have a great year! Hooray for your magical classroom! I love that! So happy you linked up!